As I sit here, about seven hours prior to tip-off of Sixers-Heat, it’s hard to put it into words how I’m feeling. Yes, tonight is about Dwyane, but it’s also about South Florida and its fans. It’s a final goodbye. A final chance to chant “MVP!” as D-Wade shoots free throws. A final chance to (hopefully) hear his name introduced by Michael Baiamonte in the starting lineup. A final chance to see the greatest athlete in Florida sports history play. Dwayne means what he does to South Florida not only because of the success on the court but also because of his actions off the court. Think of the moment in March of 2018 when Wade visited Stoneman Douglas to give those kids something to remember for the rest of their lives. No (or very few) celebrity or athlete would’ve had an impact on those students like Wade did. Think of last week, when Dwayne showed his support for his son Zion at the Miami Beach Pride Parade. A few of these moments sum up why he’s one of the best ambassadors for a city. He’s not just a superior athlete, but a superior person. Now, here’s the personal section. I moved to South Florida in 2006 with my family at the age of 8. (I believe it’s the right timeline, don’t quote me on that) My first few months in Florida were fine, but I didn’t necessarily feel at home. I didn’t have anything about the state that felt like mine. However, when I was watching a Indians– Yankees playoff game, and the Yankees lost, I decided to flip the channel, as an angry sports fan does. 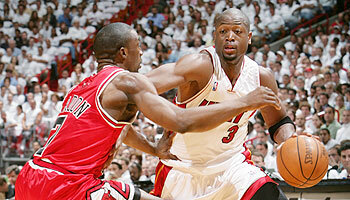 The channel then flipped to game 4 of the Heat’s 2007 first round matchup against the Bulls. 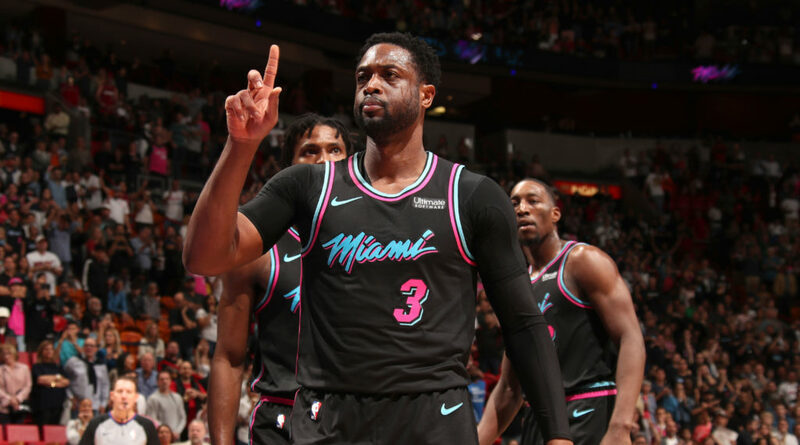 They got swept, but I was instantly hooked on #HeatCulture (you can make fun of me, it’s fine). Instantly, his swagger on the court and his attack-the-basket mindset had me hooked for life. And, finally, the championships. 2006, 2012 and 2013. They speak volumes, but the impact on Florida is greater than you can imagine. Sure, the Marlins won in 97’ and 2003. Those just don’t have the same impact as the Marlins are known as a less-than-trustworthy organization and, to this day, have made the playoffs since. There’s a different culture when it comes to the Marlins and the Heat. Dwayne’s championships along with a (relative) sustained success is why Miami is a basketball town. Do I even need to bring up the Dolphins? Or the Panthers? As I watch Dwyane’s final game tonight, the one thing I wish I could relay to him is gratitude. Not only as a lonely kid who moved to Florida and fell in love with the Miami Heat, but if I was speaking for the entire fanbase. He represented South Florida in the best way possible.